“Print” the map to pdf – which is easy to distribute and can form the basis of discussion at a distance. 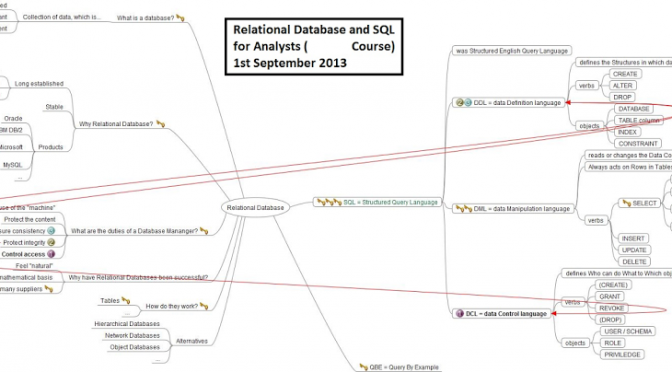 A recent project of mine has been creating an introductory course titled “SQL and Relational Databases for analysts”. The objective of the course was to give a basic understanding of SQL to Business and Technical Analysts. It was intended to use MS SQL Server, but not be a course on SQL Server. The reason for this was to make the skills learned as portable as reasonably possible. As it was intended to be an introduction, certain things I would like to have included (like UNION, HAVING and the database catalogue) didn’t make the cut on grounds of keeping the size of the course down. Anyway, the content of the course was documented in a mind-map which was then discussed with people in different places over a short period. I’ve attached the final version of the mind-map. Everything in the mind-map (with the exception of the “title block” in the middle) was produced in Freemind. The mind-map proved to be useful for agreeing what the content and structure of the course was going to be and then as a reminder of scope during the development of the course. Here’s mind-map (it was intended to be printed, if that ever happened, on A3 paper).